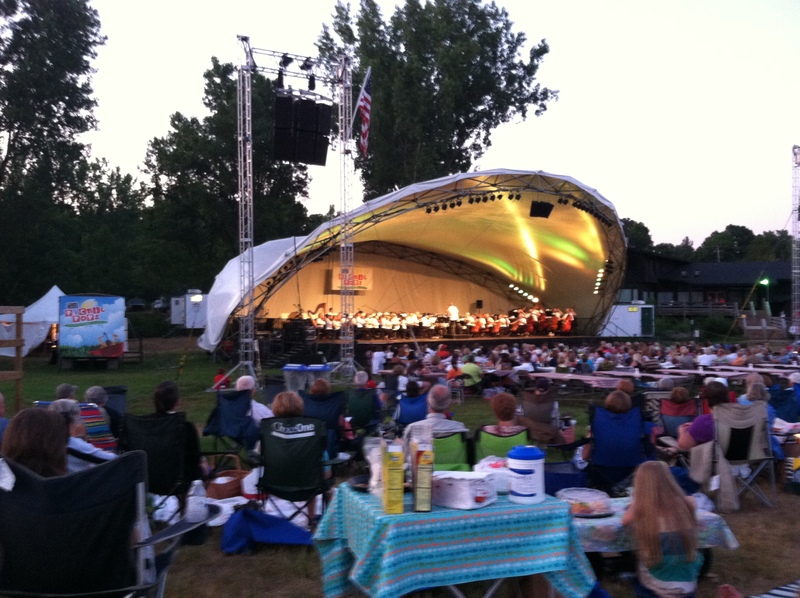 The Grand Rapids Symphony kicked off its 2012 Picnic Pops series last night at the Cannonsburg Ski Area with the “Best of”. The best fireworks show of the summer is paired with the best in classical music. Enjoy audience favorites like Rossini’s William Tell Overture, Dvorak’s New World Symphony finale, and Tchaikovsky’s 1812 Overture. Even a novice like me knew the music and enjoyed it. You still have time tonight to see the “Best” with the fireworks. As you can see from the schedule below not all the themes have classical music, personally I am looking forward to the Kansas Concert with the Pops. Pack the cooler with food and drinks, bring a blanket or chair, and enjoy the outdoor concerts. If you have little ones bring them cause their is room for them to run and run up the hill and not to mention they have kids play area before the show with face painting and musical petting zoo!!! The cool part is you can get a table up front or sit on the hill! As I looked around to see how everyone was picnicking, people were eating subs & sodas to tables cloths with linen, china, crystal and nice bottles of wine. Either way I think you will have fun at this event. Highly recommend this night out on the town!! The “Best of Edition.” The best fireworks show of the summer is paired with the best in classical music. Members of the mega-star act Frankie Valli and the Four Seasons perform the hits you know and love. Join your Symphony for a tribute to one of America’s most beloved singer/songwriters. KANSAS – Live in Concert! Fourth Thursday and Friday Special Event: KANSAS – Live in Concert! Table, chair and group tickets available through Symphony office only. 616/454-9451, Ext. 4.